Well made. Colors are accurate. Liven up your bedroom with this sunny orange and taupe floral printsix-piece bedding set. The distinctive medallion pattern shows offa vibrant and contemporary look to suit any decor. The microfiberpolyester coverlet is ultra soft and machine washable for easycleaning. The decorative pillows feature embroidered detailing, providing a contemporary and stylish appearance. 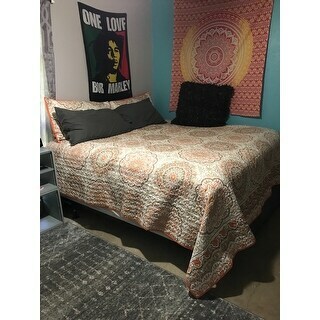 This coverlet is exactly as shown in the picture. It arrived promptly and in good condition. The quality is very good. I have not seen even a single loose thread. It is a very light coverlet, but this is perfect for us in the summer. I have always previously had a comforter or duvet on our bed, year-round, and I was worried at first about how this coverlet would look. I expected it would look flat and tacky, but I am so glad I was so wrong! It is very pretty! And the decorative pillows that come with it finish the look perfectly! I was also concerned at first about the size. 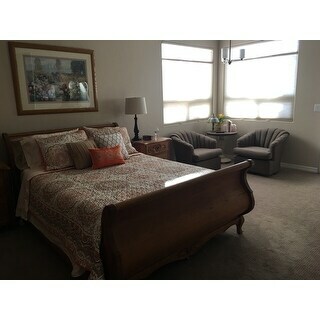 We have a California King size bed and the size options on the coverlet only had King/Cal. King. However, the dimensions seemed right (104 x 94 inches), and it fits our bed very well. We even have an extra deep mattress, and there is still plenty of coverlet to go around! Overall, I am very pleased with this coverlet set and will happily recommend this product and brand to everyone I know. Loved the color, loved the weight, loved everything about it and especially that it's cotton so it's machine washable and not cheap feeling like polyester. It looks just like the picture so if you're wondering if the colors are slightly off, they're not. Even our dog loved it. Love the colors, what I don’t love is the lack of overhang on the sides. I have a 14 inch mattress. It doesn’t even come close to covering the sides of the mattress. Purchased this for the spring/summer months. Absolutely beautiful. Fits my California King perfectly. Love this bedding set. Got it for my sons room and it looks and feels great. Good quality, great price. Fits great. Throw pillows were great, but not shown in pic because he did not want them on his bed. I thought the color of the bedding was orange and gray, but it’s actually a brown. It still looks good with the gray in his room however. This comforter is a lively and happy looking addition to my bedroom. 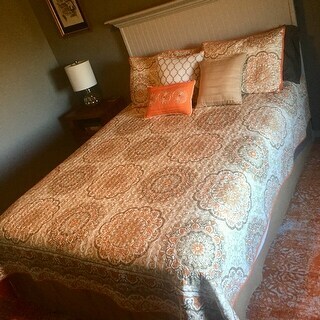 I've started adding touches of orange and with an 8x10 orange area rug (from Overstock), placed beneath the bed, this comforter brought it all together. It is gorgeous, has a beautiful feel, and wraps comfortably around your body instead of sitting high like so many other comforters. I own 4 quilted pieces from this brand and will continue to purchase them. 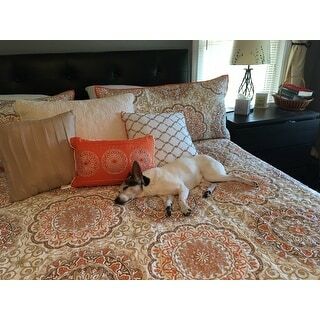 The are comfortable, great quality, easy to wash, and the added decorative pillows are always a plus which makes it worth the price. I have to say you will not be disappointed in this set. 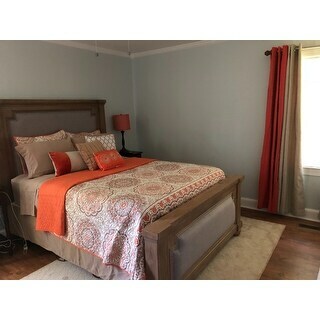 The color is very vibrant accented with a bold orange pillow and the underside of this quilt. I love the fact that it is machine washable. It washes up extremely well and it is very attractive. 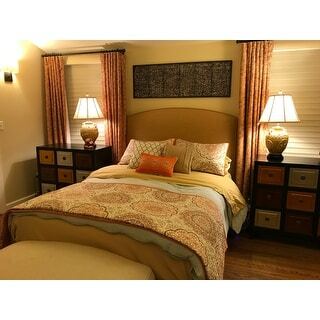 I have purchased several of the quilt sets and they are excellent quality for this price point. I put this set in our new Air B&B, and it's perfect! The colors are great and so easy to find rugs, curtains and accessories to match. LOVE! Love this bedding set. It’s exactly what I was looking for. It works great in our bedroom and it’s a nice quality too which I am very happy about. I’ve received many compliments on this bedding set. we really love the look of this set. the colors are just as advertised in the photos. super happy with the purchase. good value for the $. This is a very attractive and adorable set. It dressed my room up without overwhelming it just as I hoped. I found that what looked like a more gray/taupe tone in the pattern in the pictures was in reality more brown, but it still works pretty well. 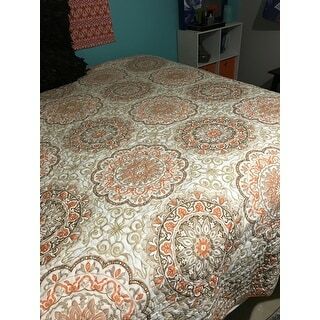 I love this coverlet set. It is very pretty and I am happy with the quality. The quilt is pretty and soft. The pillows look and feel cheap - we ended up not using two of them. The king size quilt is a little small for our king bed, so we leave it folded it up at the end of the bed. Love my quilt, looks nicer in person. It’s very good quality. The matching pillow are beautiful, the design and colors tie in very well. I definitely recommend. Beautiful, vibrant, and well made product. "I'm debating using in a room with light cool grey walls. Looks like grey on the walls in the picture, is that true?" "What color bed skirt would you use? Tan?" I love this set!! I used tan. I used this quilt as an accent piece over a white bedspread and it looks terrific! So a white skirt would look great. I really love this set! 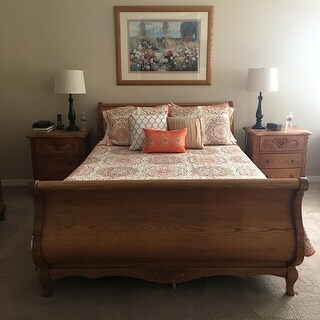 "Would this look nice with grey sheets? I think it would but I can't tell if that's more brown or more grey in the colors. I know it says "taupe" but sometimes taupe can favor the grey family"
"What color are the shams? Are they Euro or are they king size? I hope I get an answer because the sham color is important." Hello Patsy L. G., the shams are multi color like the blanket. If you choose king you will get the king size shams. Have a great day! Liked the color/pattern and had the right size.